As revealed by Steven Levy in his great book In The Plex, in the early days of Google one of the founders’ ideas for advertising the new search engine was to project a lazer image of the Google logo on the moon. 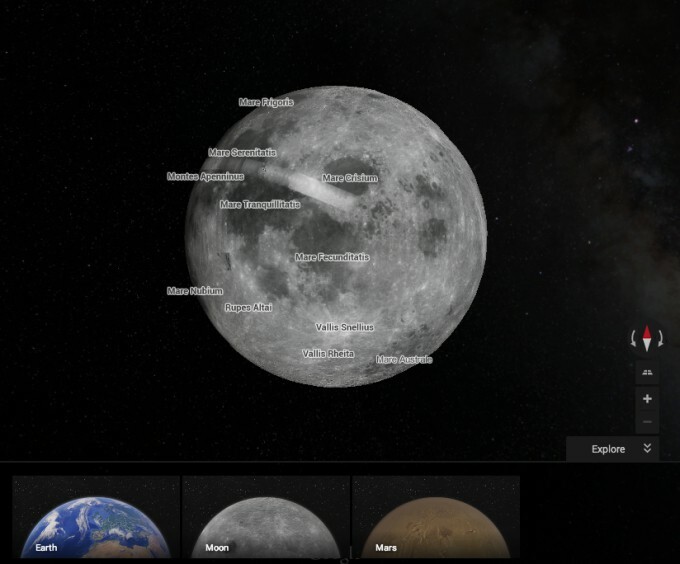 That idea obviously didn’t happen, but a new Easter Egg for Google Maps on PC does at least let users explore the surface of the moon, alongside that of Mars, to celebrate the second anniversary of the Curiosity rover touching down on the Red Planet’s surface. Users will need the new version of Google Maps for this to work, which means that if you’ve jumped back to the classic version, you’ll have to switch temporarily in order to take advantage of the feature. Once using the right version of Google Maps, click the “Google Earth” icon in the bottom left and zoom out as far as you can. Following that, options for “Moon” and “Mars” should appear at the bottom of your screen. After that, you’ll be able to begin your Google approved trawl of the stars, perhaps while thinking what the search giant should rename Google Earth now that that label no longer applies.